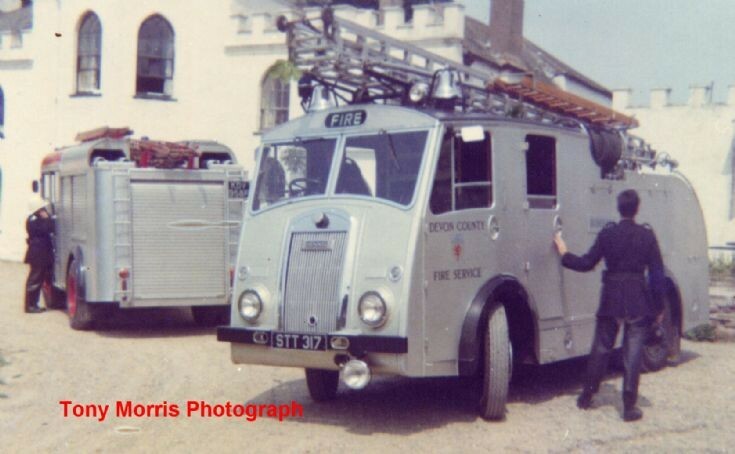 As I mentioned when I uploaded a photo of OTA 966, the other Dennis F8 at Bideford was this WrL. By the time this photo was taken in 1968, OTA 966 had been replaced by the Bedford WrT seen in the background. Added by John D on 16 July 2011. Merryweather gut buster 13.5m ladder as well! Added by Davey G on 18 July 2011. You mean 45ft of course (pre decimalisation). A short 50ft escape without the wheels or levers, another flawed concept. Added by Neal Glover on 18 July 2011. Very true neal, but since there is a lot of whipper snappers on here, and friends from accross europe, I figured I should go metric. Added by Davey G on 19 July 2011. Mercifully these long extension ladders have become a lot lighter over the years; the 15 meter three section alloy ladder used by the BSPP these days weighs only 75 KG. But it still requires a lot more effort than an old wheeled escape. However, Paris has loads of interior courtyard apartment buildings where a wheeled escape or aerial truck just can't fit through the doors! Added by Rob Johnson on 04 April 2019. Did Devon have a lot of appliances that were all polished aluminimum ? seems unusual to have no red paint at all ! Added by CraigW on 10 April 2019.